This is an updated post from the original so that the recipe is easier to follow and the photos are improved. It’s also an update because we’ve never seen geren in the meze fridges of restaurants since the experience we had in Dalyan. We can tell you, though, that that means a lot of people are missing out. Follow our geren recipe and make your own at home. Hopefully, you’ll agree with us. Turkish cuisine is abundant with meze dishes and those with a yoghurt base are always popular. Turks love to add various herbs, spices salad stuffs and vegetables to yoghurt to make a meze dish and geren is no exception – it’s just that you never see it anywhere. We discovered geren in Dalyan in a restaurant along the river. We spotted it in the glass fridges straight away as we decided what to order; it jumped out at us because neither of us recognised it. 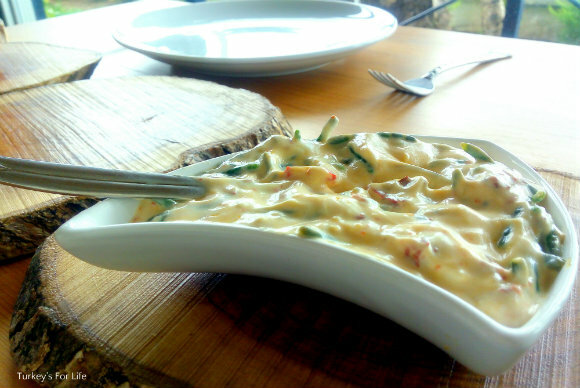 The waiter introduced it as geren; a yoghurt-based meze containing sea beans. ‘Sea beans’ is how deniz börülcesi is usually translated to English from the Turkish. For all you English speakers out there, you’ll probably be more familiar with the word, samphire. In most meze fridges around the Fethiye area of Turkey, you’re more likely to see deniz börülcesi dressed and marinated in finely chopped garlic, lemon and olive oil. We’ve enjoyed it served in this way many times in the past in the Fethiye’s eateries. But, when we ordered geren, we were immediate converts and decided to try to recreate the recipe at home. We think we came pretty close to the meze we ate in Dalyan. Samphire grows wild along shorelines and in mudflats and has a real salty tang to it. Lots of people will forage for their own and, as it tastes of the sea, serve it as a side to fish dishes. It can be eaten raw but it’s salty flavour is strong, so, for this recipe, we’ll be blanching it to calm the flavours and make them more subtle. When samphire is in season it is widely available on Fethiye market and, of course, around the stalls of the fish market. It’s sold in bunches for around 1 lira and is always wrapped in white paper around its base. Easily recognisable if you’re not sure what you’re looking for. If you can’t buy it where you are and you live near the sea, you could always go down to the shore to pick some of your own. Before we start, just a note on preparing your samphire. We’re only looking for the crisp young shoots of this succulent. In places, especially around the base and mid section, samphire can be woody and tough and those are the bits you definitely don’t want in your geren. Depending on the age of the shoots you bought – or foraged for – you could be discarding quite a bit. Don’t worry; this is normal. You can always throw them in a stock to add a salty flavour. Anyway, back to our geren recipe. Geren is a perfect addition to your summer meze table. 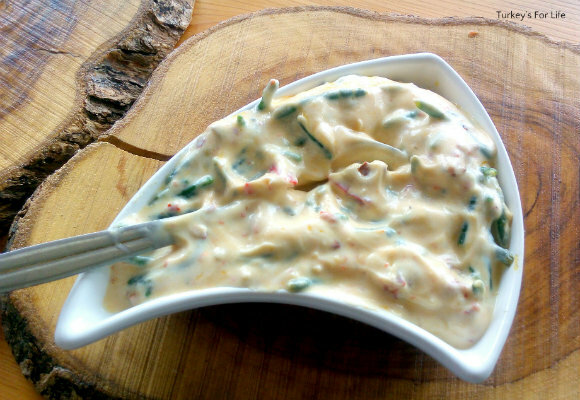 Creamy yoghurt mixed with samphire (deniz börülcesi) gives a crunchy taste of the sea. After removing the tips from your samphire you need to get the rest of the young shoots. Hold the top of the stalk between your finger and thumb so any younger shoots are pointing upwards. With the finger and thumb of your other hand, grip the top and run down the stalk. The younger shoots will snap away and you can add these to your tips. Bring a small pan of water to the boil. Now plunge your samphire into the boiling water for around 3 minutes. Drain in a colander and run cold water over the smaphire so that it doesn't continue to cook. Meanwhile, fry your pepper in hot oil until the edges are charred and then remove from the heat. 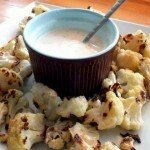 Mix your yoghurt and garlic in a bowl. Add the olive oil and chilli flakes and mix thoroughly until the oil is blended. When your samphire and peppers have cooled down, add these to your yoghurt and mix. Place your geren in the fridge for an hour or so until chilled. As with all our recipes, calories per serving of geren can vary depending on the brand of yoghurt you are using and the serving size. We are serving our geren as a meze so this recipe will make around six servings. Your geren will keep in the fridge for a few days if covered. And that’s how we make geren. Serve your geren as a meze, along with other summer Turkish meze dishes such as Antep Ezmesi or our barbunya pilaki recipe. If you have chilli flakes, use these as they’ll begin to rehydrate in the oil and you’ll get lovely swirls of redness running through the yoghurt and oil. The geren in the photo above was made the day before and you can see the hints of red infusing into the yoghurt. So tasty! Don’t forget to check out our full recipe collection so you can make your own Turkish food at home. It looks so refreshingly delightful. I love the table setting and sunny atmosphere too. I’ve had a post about this in waiting – I can’t find the stuff anywhere!! Interesting that you have it where you are… Istanbul’da yok! This is just about my favourite mezze… We have eaten it in Selcuk and I have tried to make it in London (with some success). Running out of pul biber must be a horrible thing! Being homeless (in temp accomodation pending moving to Turkey) we have none. Not easy to find these in the States, but would love to have some! I actually saw some sea asparagus in the store the other day. I don’t know of it is the same as samphire but it would make a good substitute. What the heck is Samphire? What would one use instead here in California? Any suggestions? @ Belinda: The young shoots are lovely. Good in a salad and it means you don’t need salt. @ Bellini: I bet sea asparagus would make a perfect substitute if it isn’t the same as samphire. @ Helene: Hmmmm, we have the sea asparagus option above. Actually, anything green and crunch would suffice and then you would just need to add salt as samphire is salty. There are some alternative names for samphire in the States. Here’s a link to them from Wikirecipes. Samphire has been “The Food Discovery” of this season for me. Lovely with just olive oil and lemon juice as well. @ Claudia: I bought it in Kadikoy market on Saturday. 3-4 stalls had it. @ Sarah: It’s lovely. Sea samphire is better than rock samphire. More delicate. Interesting…I’ve been seeing this a lot at the pazars in Besiktas and 4Levent and wondered what to do with this “seaweed-looking creature.” Now I know! Thanks Julia!